Trump’s Pick for Defense Sec’y Made Millions in Defense Industry After His 2013 Retirement | Democracy Now! During the confirmation hearing for retired General James “Mad Dog” Mattis, several senators asked whether he would support Defense Department projects in their home states, including Senator Elizabeth Warren (D-Massachusetts). 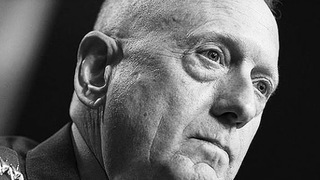 Mattis had a 41-year military career before he retired in 2013, and Politico reports his financial disclosure statement says that he is worth more than $10 million. Some of his wealth was garnered after he retired when he worked for General Dynamics, among other companies. We speak with retired Colonel Andrew Bacevich and Aaron Glantz, a senior reporter at Reveal from The Center for Investigative Reporting. ANDREW BACEVICH: To your question, Juan, I was chagrined at the extent to which quite a number of the members of the Senate Armed Services Committee, provided their few minutes to pose questions, basically posed questions that said to General Mattis, “Hey, can you promise me that if you become secretary of defense, that you are going to ensure that my state’s investment in the military-industrial complex is going to be protected?” We heard that from Senator Blumenthal of Connecticut, who went out of his way to get Mattis on the record of saying that he supported the building of more submarines, which just happen to be produced in Connecticut. And Senator Warren, from my state, went through a long list of assets that are available here in Massachusetts, between labs and research facilities, wanted to make sure that Mattis was on the record of saying that he appreciated that, therefore the expectation that our own contribution to the military-industrial complex is going to be preserved. AMY GOODMAN: Andrew Bacevich, can you talk about the issue of the waiver? The Senate just voted on this waiver. The significance of why we do have a rule in place in the United States that the defense secretary has to serve in civilian life for seven years and not be active-duty, active military? Retired Mattis has been there—what? He left in 2013, so he needed this waiver? ANDREW BACEVICH: You know, if somehow we had to have a general be secretary of defense, I’d probably say Mattis may be better than most of the alternatives. He certainly is a more of a reasonable figure, let’s say, than Lieutenant General Flynn, who’s about to become the national security adviser. But that said, as a matter principle, I think it’s a bad idea to have a former general running the Pentagon. Earlier on, Aaron talked about—made mention of the fact that Mattis’s entire professional career, until his retirement, has been in the military. And I have to say that we need to appreciate the extent to which that kind of a professional background has a shaping and, indeed, I would say, a narrowing effect on a person’s outlook. If we decided to have somebody who was a cardinal archbishop in the Catholic Church become secretary of defense, well, we would have some expectation that all those years spent in that very specific, all-encompassing environment would have a profound effect on the outlook of that individual. I think that’s true with military people. And my problem is that given where we are, our position in the world, given the absence of success of our military activism, I don’t think we need somebody who has that mindset. I think we need somebody as a defense secretary who can bring to the office greater creativity than General Mattis manifested yesterday when he was responding to the questions of the Senate Armed Services Committee. He’s a very conventional marine. That’s not what we need right now. JUAN GONZÁLEZ: Aaron Glantz, I’d like to ask you about, you—both you and Andrew Bacevich have mentioned General Mattis’s long career, more than 40 years, in the military. But Politico reported that his financial disclosure statement says that he’s worth more than $10 million. Now, apparently, all of this wealth was garnered just in the few years after he retired, when he worked for, among other companies, the defense giant General Dynamics. Your response to this issue of his sudden wealth after he left the military? AARON GLANTZ: Juan, it’s not uncommon to have a senior military officer go into consulting after retirement, which is exactly what General Mattis did. It is interesting that this is among the many other issues that wasn’t really discussed during the hearing, that could have been discussed instead of the pork-barrel projects that you were talking about. And, you know, he could have been asked about these apparent conflicts of interest that might have developed as a result of his consulting work, and how he might deal with them. On the issue of civilian control of the military, another point to consider is that not only are we talking about General Mattis needing a waiver to this law that goes back to 1947, but also, in addition to General Flynn, the incoming national security adviser, we also have General Kelly, who is going to be most likely the secretary of homeland security. And then, of course, the head of the Joint Chiefs of Staff will still be in the room, General Dunford. So, there is going to be four generals, if all, you know, are confirmed, in the room talking with Trump. And to the point of narrowing, you know, all of these different generals have their own perspective, but it does mean that there are perspectives that you might normally have in the room that will be missing because of the overwhelming presence of retired and current military in the administration at a high level. AMY GOODMAN: Aaron Glantz, do you think that General Bacevich—sorry, do you think that General Mattis should be brought up on war crimes charges? AARON GLANTZ: I think it’s something that we need to seriously explore here. As I said in my article, the case that I document regarding General Mattis’s command in Fallujah resembles, in many ways, the case that the United States of America brought against General Yamashita of Japan following World War II. He was not accused of directly perpetrating war crimes during World War II, but he had command authority over Japanese troops that did commit very serious war crimes in Southeast Asia. And they involved very similar activities to the ones that the U.S. marines under General Mattis’s command committed in Fallujah. And this is the doctrine of command responsibility. The U.S. Supreme Court ultimately upheld the execution of General Yamashita. Other military commanders in Yugoslavia and Rwanda have been convicted under similar doctrines. And I think that this is something that really should be discussed thoroughly before his confirmation is approved. And at this point, it doesn’t look likely. AMY GOODMAN: Well, I want to thank you very much all for being with us. We want to thank Aaron Glantz, senior reporter at Reveal with The Center for Investigative Journalism. We want to thank Andrew Bacevich, a professor emeritus at Boston University, retired colonel and Vietnam vet, and Trita Parsi, founder and president of the National Iranian American Council. When we come back, we return to an earlier confirmation hearing this week. You will hear what many Republican senators did not stay to hear, their colleagues in the House and the Senate testifying—in this case, around Jeff Sessions. Stay with us.